Just as teams attempt to work together on the field, the television or radio production that is covering the event also excels through teamwork. There are just a few brief outlines of the many production jobs available in sports broadcast media. On some of the positions, there are resources on more in-depth profiles of the jobs. 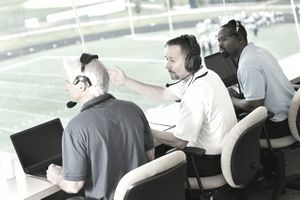 Play-by-play announcers provide a description of the event while color commentators—often former players or coaches—provide expert analysis of the game’s events. Many productions also include studio commentators that provide analysis of the games before, during, and after the event. Also, many radio and television broadcasts include reporters who talk with coaches during the games to provide updates on issues like injuries. They also may interview players and coaches after the game. As the action unfolds on the field, court, or racetrack, audio technicians help bring the event’s sounds to the sports fan. Critical in both radio and television broadcasts of sports, audio technicians set up and monitor equipment used to capture the action, which includes microphones to pick up crowd noise, the noises from the field of play, as well as the broadcast’s on-air talent. Video technicians are responsible for setting up and operating the various video components needed to broadcast a sporting event. They also work the various sound equipment to assure a consistent audio level during the broadcast. Professionally trained either in school or on the job, camera operators do the fieldwork of capturing sports action for the television broadcast. They typically are assigned specific parts of the game with other camera operators focusing on different aspects. Camera operators often work in the elements and carry heavy loads of equipment as they move to assigned positions. These engineers, who typically receive broadcast training, specialize in the many graphics that appear during a sports broadcast—from scoring updates, presentations of players names, to play diagrams during the action. In television broadcasts, fans expect replays. In fact, they expect replays from several angles. Professionally-trained reply technicians oversee the video and cue up the replays as needed. Often, they may slow the video to a crawl to allow even greater insight. These professionals make the decisions that will shape the broadcast. They are in charge of providing story angles to the on-air talent while making decisions on the look of the show. From camera angles to the use of graphics, sound, and all these decisions made by the producers and directors allow the broadcast to tell the story. Spotters assist the production crew with names and events during a broadcast. In sporting events with a lot of participants, it often is difficult to keep track of every competitor and spotters assist in this role. While there is an official scorekeeper, television and radio broadcasts often rely on their statisticians as well. These statisticians will focus on providing figures that give context to the game during play. They may advise the announcers and production when a baseball player may be reaching a milestone home run or a football running back is closing in on a 100-yard game. The stage manager makes sure everything is in its proper place for the broadcast, specifically relative to the on-air personalities. The stage manager makes sure chairs and equipment are in the right place. Cameras that focus on the personalities also need to be placed properly. Technical directors typically work their way up from other broadcast positions as prompters and studio camera operators to eventually work with video and audio controls. This past experience as an operator proves useful as the technical director works to make sure all broadcast components are working together. There are other jobs available in radio and television broadcast, but this overview should give you an idea of the varied positions available. Many people are interested in breaking into this segment of the business by starting on their own and creating a podcast or video blog to gain experience, sometimes while still attending college.